Removed From: 1982 Kawasaki 750 LTD KZ750H. The fuse has light scratches. This is an OEM Kawasaki fuse holder removed from a 1982 KZ75LTD. 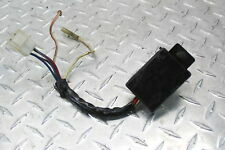 The Kawasaki part number for this item is 26004-1014 and is shown to fit the following models;. 1980 KZ440-A1 LTD ('81-'83 A2). 1980 KZ440-D1 LTD Belt ('81-'83 D2). This is a fuse box removed from a 79 KZ750 twin. It is in good usable condition. removed from a bike with 13,000 miles on the clock. 82 Kawasaki KZ 750 H 4 cyl LTD. 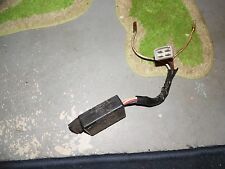 Photos of Used parts are generally of the item listed unless there is a quantity more than 1 available. This is a used part that has been cleaned, tested and inspected to ensure quality. This is a fuse box off of a 1981 kawasaki kz750 h. it is in working order and can be used. 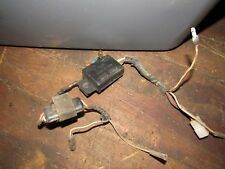 This is a working fuse box off of a 1981 Kawasaki kz750 ltd. it can be put on and used. Removed From: 1982 Kawasaki 750 LTD KZ750H with 52125 miles. The fuse box has light scratches. Our goal is to provide quality used parts at low prices. It can be put on and used. BUSS FUSE BLOCK 6 POSITION 15600-06-20. Misc Body Parts Mirrors. Eyewear Clothing & Accessories. Engine Related Parts. Electrical and Lighting. Classic Picks. PRODUCT TYPEElectrical. MANUFACTURER PART NUMBER15600-06-20. Lots of these parts will fit the 1980, 1981, 1982, & 1983 Kawasaki KZ750 H LTD models. PART FOR SALE: Fuse box housing. PART IS OFF OF A: 1981 Kawasaki KZ750-H2 LTD. - PARTS MAY WORK WITH DIFFERENT YEARS & MODELS. Th a nk sf or sh opp i ng ! The Rummage Barn Used Motorcycle Parts Division. BEFORE ordering. There is no warranty on this product. Lots of these parts will fit the 1980, 1981, 1982, & 1983 Kawasaki KZ750 H LTD models. 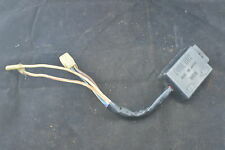 PART FOR SALE: Battery main fuse. 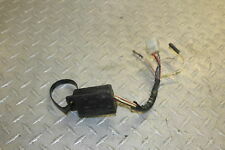 PART IS OFF OF A: 1981 Kawasaki KZ750-H2 LTD. - PARTS MAY WORK WITH DIFFERENT YEARS & MODELS. One 20 Amp and two 10 Amp fuses already installed. 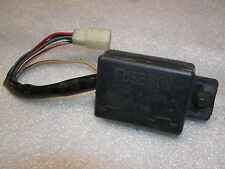 New Genuine Kawasaki Reproduction 3-Way Fuse Box Assembly 26004-035. Note: May fit other years or models. Replaces Emgo OEM Number: 48-93330. Misc Body Parts Mirrors. This fuse box is in good condition. WHY BUY FROM US?. Intakt, guter Zustand, die Kabel sind gut, original Kawasaki! Good shape, works, wiring still looks good, genuine Kawasaki!